Today the broken remains of the Hassler provide tantalizing evidence of the ship’s innovative construction and engineering. Built in 1871 at a Camden, New Jersey shipyard, the Hassler was the first Coast Survey vessel constructed from iron. Despite offering greater strength and substantially lighter weight than a wooden hull of comparable size, American shipbuilders were much slower to adopt iron hull construction than their British counterparts, largely resisting until after the Civil War. Technological innovation proceeded rapidly during the 1870’s as shipbuilders became more familiar with the material. Federal records document dozens of changes to the ship’s design during her construction, many reflecting new ideas about iron. 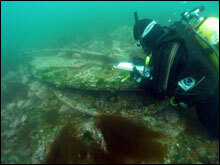 Some of these, including the double bottom are visible on the wreck today. At 151 feet in length, 24.5 in breadth and 10 feet in depth of hold, the Hassler could transit rough offshore waters and survey in treacherous, often shallow, coastal areas. In the spring of 1870, the Inspector of Hydrography for the U.S. Coast Survey Carlile Patterson, penned the first description of the projected new vessel whose purpose was to chart the waters of U.S. Pacific Coast. The vessel would need to be economical, sea worthy, and yet draw only a modest amount of water He called for an iron steamer of 325 tons, one that had a draught of only nine feet and could sustain a speed of eight knots. She must carry as much coal as possible while burning no more than two and one-half tons of coal per day during normal operation. Their must be room for two months provisions for a crew of 37. Patterson estimated the cost of the vessel at a meager $58,000. What Patterson contemplated, although he may not have realized it at the time, was a significant experiment in American shipbuilding and ocean science. The ship, ultimately named the Hassler, after the first Superintendent of the U.S. Coast Survey Ferdinand R. Hassler, was built in 1871 under the direction of engineer John Dialogue at the River Iron Works in Camden, New Jersey, on the Delaware River--considered the birthplace of modern shipbuilding in the United States. In the decades after the Civil War, Delaware River builders led the transformation from wood to iron and finally to steel ships. The Hassler represents construction during the earliest period in the new era of engineered iron, steel, and compound steam in American shipbuilding. Designed for long periods away from port, the ship had two modes of propulsion: a three-masted schooner sailing rig, and a state of the art 125 horsepower steeple compound engine. The engine possessed 18.1-inch high pressure and 28-inch low pressure cylinders. Compound high and low-pressure cylinders allowed for the repeated use of boiler-generated steam in propelling the vessel. This produced an economy of operation and gave the ship a geographical range superior to previous steam vessels. Hassler’s cylinders consisted of a vertical array with the small high-pressure cylinder sitting above the larger low-pressure cylinder. The arrangement conserved space and made it possible to operate the engine using only one of the two cylinders. If one cylinder failed, the vessel could still move under steama useful feature when surveying the dangerous northern Pacific coasts. Philadelphia shipyards pioneered the use of marine compound engines in the United States, and the Hassler had the first such engine installed in an U.S. government vessel. Innovation comes at a price and the Hassler had problems in both design and in workmanship. In 1871, most U.S. shipyards working in iron used designs and construction techniques adapted from their experiences with wooden ships. Hassler’s builders, River Iron Works, had little shipbuilding experience in either materialalthough the yard had an extensive background constructing steam engines and boilers. Further, the $62,000 price tag left little room either for profit or for repairing mistakes made during construction. The leaks in the hull, decks, and engine fittings experienced during her maiden cruise reflect the chaos surrounding the ships evolving design and rapid construction and may testify to the new yard’s inadequate expertise. Another explanation for the problems is the laundry list of design changes ordered by the Coast Survey during her construction. Thicker frames in select areas strengthened hull, an added double bottom addressed buoyancy and strength, and a myriad of engineering and cabin configurations added cost and complexity. Time, constant change, and tight budgets did not make for easy construction and led to months of delays. In light of these problems, the Hassler Expedition in 1871 proved an excellent shakedown cruise. By the summer of 1872, Captain Carlile Patterson reported to his chief that the Hassler’s crew were finally gaining, “substantial understanding in regard to the vessel & machinery.” He noted that they would “gradually eliminate the bad workmanship in the connections . . . and those . . . experimental matters which do not prove successful.” Patterson predicted that the ship would achieve “satisfactory results” conducting the class of work for which she was built. The prediction proved correct. The most impressive improvements came in the steeple compound engine. The engine’s designer Charles Emery investigated its operations, imposing strict experimental controls, especially in the monitoring of coal consumption. Emery’s careful analysis of both the mechanical and human elements of the propulsion system paid off. Within a few months, Captain Philip Johnson reported that the engine consumed an average of .83 tons of coal per operating day, about one-third of the 2.5 tons per day maximum envisaged in 1870. Captain Johnson’s observations support Emery’s report that the engine operated at more than twice the efficiency of traditional steam engines and consumed fuel at only two-thirds of the rate of the best new high-pressure engines. Robert Thurston in his authoritative A History of the Growth of the Steam-Engine, published in 1878, cited the Hassler’s engine as providing “an ordinary seagoing performance which is probably equal to anything yet accomplished.” Engineers serving on the vessel continued to modify and improve the power plant into the early 1880s, and the ship remained fuel-efficient to the end of her career. Many American shipbuilders in the early 1870s harbored concerns about the durability and buoyancy of iron. One accommodation was to construct irons hulls with double bottoms. This created a sealed space between the bilge, (the lowest interior place inside the ship) and the outer hull. A series of watertight bulkheads further divided the space into a series of empty voids. In most ships, each void had access plates to allow for inspection and regular painting. On the Hassler, the double bottom occured as a major design change during construction, and some of the spaces lacked any form of access. This included the voids underneath of the coalbunkers. Without regular inspections and painting, saltwater combined with heat from the boilers and the acid run off from wet coal created serious corrosion problems that plagued the Hassler throughout her career. In 1883, Lt. Nichols, perhaps the Hassler’s most active Captain, reported that the section of the double bottom beneath the boilers had entirely corroded away. Although this did not appear to alarm him, such corrosion substantially weakened the hull. Although major repairs took place when the vessel underwent a significant overhaul and received new boilers in 1884, mid ship corrosion remained problem. A surface inspection conducted later in the year revealed that many of the iron plates along the main rail had partially separated from the frames. Corrosion had also taken its toll on the frames themselves, with many of them “badly eaten away.” Based on his observations, Harker opined that while he “would not have her do duty where she would be exposed to very heavy seas or pick her way through unsurveyed channels,” he considered her fit for any form of inside work. The old ship remained “economical in steaming” and comfortable for carrying men and stores. The service life in “comparatively smooth water” might be three to five years. The Hassler’s active career as hydrographic vessel ended after one more season, On February 15 1895, the Hydrographic Inspector Jeff Moser recommended to the Superintendent of the Coast Survey the decommissioning and sale of the vessel. The ship’s age, more than two decades of hard service, and the inability to access many watertight compartments within the double bottom had left the ship’s iron hull in poor condition. Moser’s assessment revealed that during the major repairs conducted in 1893, San Francisco shipbuilders refused to tear into the bottom of the ship to patch holes and replace iron plates. Rather, they poured cement in areas below the engines and boilers to seal leaks. In some respects, the Hassler was like a patient with terminal cancerthe shipyard “surgeons” could not cut out the corrosion without destroying the ship. Pouring in the cement bought a few more years but could not solve a problem created by the ship’s original design and iron construction. The Coast Survey decommissioned the Hassler on May 25, 1895. They took pains to stabilize and protect the ship, thoroughly cleaning and painting inside and out. Placing tarps over the decks and fragile areas of machinery, (which remained in excellent condition), the ship went into ordinary and the order was given to sell her. For the next two years, a long time member of the Hassler’s crew tended the ship, keeping up the paintwork and periodically firing the boilers.